Portable applications are great because they don't need to be installed, they don't mess with the registry and you can carry it along with you in a pen drive. Portable applications aren't only for using in portable devices. They can be used on a PC too and the best thing about it is, as I've mentioned, you don't need to install it. Just copy it to your hard disk and run. Several applications are already available in a portable format, but not all. So I'm going to show you how to turn any application into a portable one. Let's do it with Microsoft Office 2003. We will use a software called Thinstall (Update: Thinstall is now VMWare ThinApp). Thinstall is an Application Virtualization Platform that enables complex software to be transformed into self-contained EXE files which can run instantly with zero installation from any data source. It creates a virtual operating system, a type of sandbox, around each “Thinstalled” application with it's own virtual registry and file system. Everything is good about Thinstall except it's price which is an outrageous $4,995. What were they thinking when they priced that!). A fully functional 30 day trial version is available for download on request (even that can be a little difficult to obtain. If you have problems getting it, contact me ). We will use that. Thinstall requires you to have a clean PC, one that has been freshly installed with Windows. Also the application that you are converting into a portable one shouldn't be already installed in the machine. But don't worry, it works equally well with an old Windows system. I had MS Office 2003 on my system and had it removed prior to this process and it worked without any problem. I'm not sure though, whether it would work with all applications. In that case, you can carry the following operations on a virtual PC. 1. 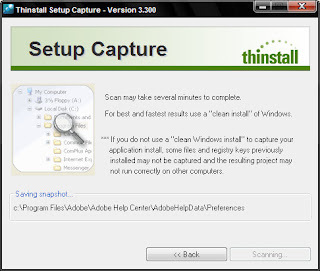 Install Thinstall and run Setup Capture (the application's main executable). Click Start. 2. Select drive C and the drive where you plan to install the application (in this case, MS Office). If you want to install MS Office in drive C itself, then select only drive C.
3. 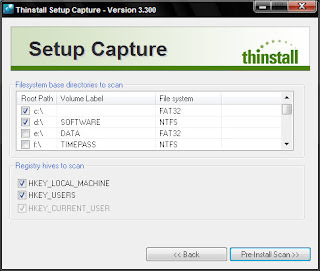 Click Pre-Install Scan and allow the program to complete scanning of the selected drives. 4. Once it finishes scanning, install MS Office on your PC like you normally would. 5. 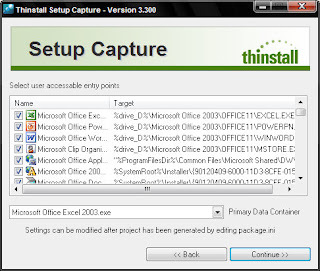 After you have finished installing Office, click Post-Install Scan and again wait till it completes the second scan. 6. You will be now asked to select the executables that you wish to make portable. Select all the boxes from the list and click continue. 7. Finally you will asked to specify a path where you wish to store the files. 8. Now open the directory where the files were saved and run build.bat. Thinstall will now create the portable files required and save them inside a folder named bin inside the same directory. Inside bin you will find the self contained exe files of MS Office. Copy this directory into your USB drive. 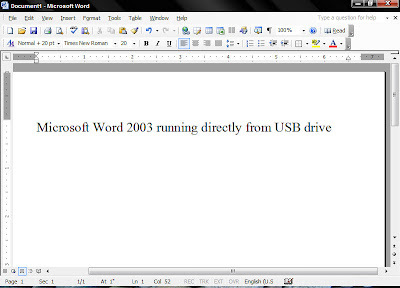 Now you can run MS Office directly from the thumb drive. 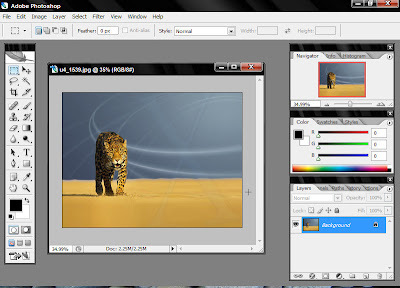 I even made a portable version of Photoshop CS2. Create as many portable applications you like! VMWare is a great soft, thanx man! That is really cool. This allows me to complement the PortableApps suite - http://www.squidoo.com/howtouseportableapps. PortableApps is all free software, but from time-to-time there is nonfree stuff I would use. Thanks! how do i get Thinstall app? Thinstall is now VMWare Thinapp. New link added to the article.